"A stock character of a mysterious and seductive woman whose charms ensnare her lovers, often leading them into compromising, dangerous, and deadly situations." My thumb and middle finger are showing one of the Femme Fatale colors, Lime Thief, which you can take a look at after the jump. Lime Thief (2 coats) is a lime green neon jelly with hexagonal glitter in blue, green, orange, and red. 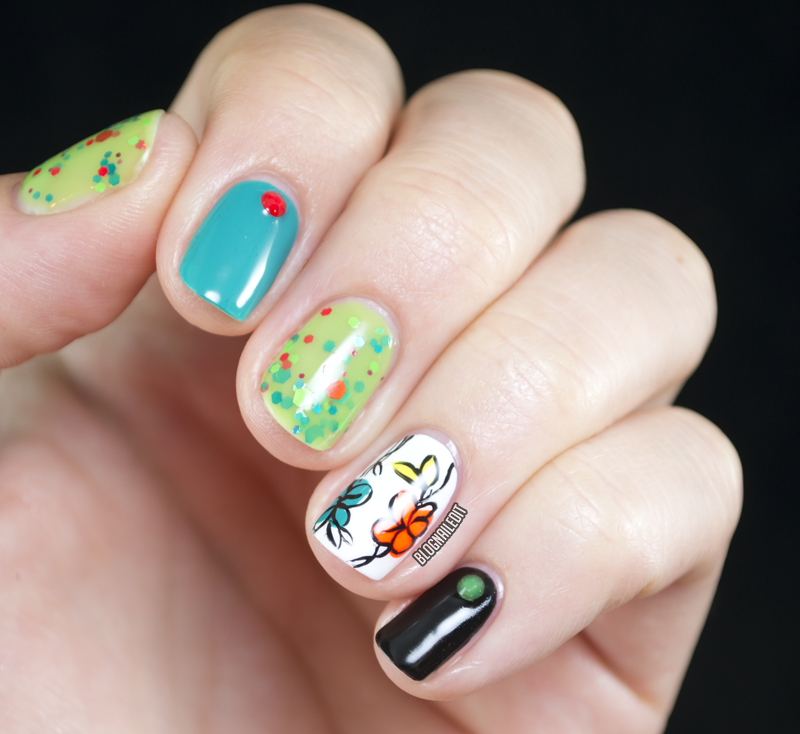 I tried to complement these in the nail art with other polish colors including Abyss (Color Club), Electric Pineapple (China Glaze), and Koo-Koo CaChoo (Color Club). God it's pretty! This color is unreal. It's so rich! 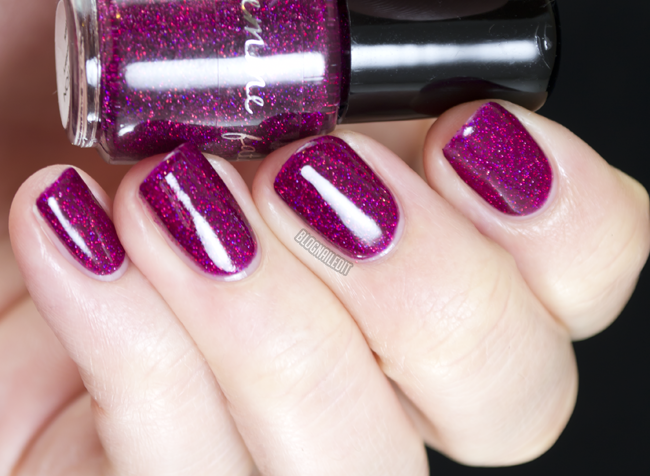 Fatal Attraction (2 coats) is a magenta jelly with stunning glitter in purple, red and pink. Definitely fatally attracted to this. Gravity Lapse (2 coats) is a steel blue holographic. It covers so well and so evenly! This is Maddening Whispers (2 coats), which is a dark steel-purple holographic. Mirror of Dawn (2 coats) is a simple, silver holo. It looks a little more purple in my shot, but it's a basic silver. Ruby Hare (2 coats) is a magenta...well...ruby holo. Great coverage again! Snapvine (3 coats) is super unusual glitter mix. Who knew that a teal jelly like this existed? It's got hexagonal glitter in pink, orange, teal and green. 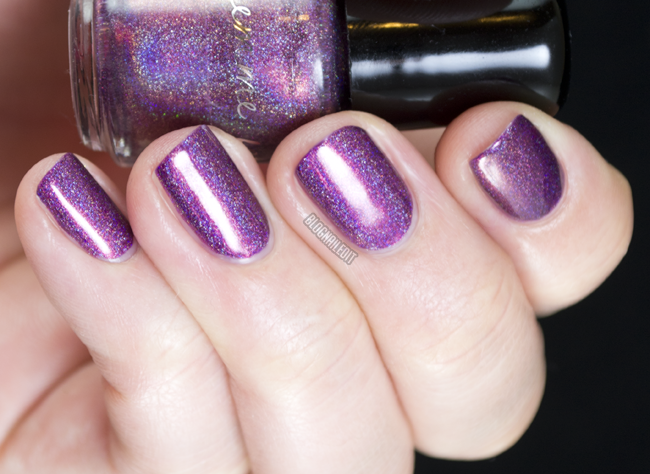 Last but not least is this shapeshifting, duo-chromey color, Twilight Meteorite (3 coats). It's a pink and purple duochrome flecked with blue. Sometimes it looks blue, sometimes it looks pink. Femme Fatale Cosmetics ships worldwide, and is not to be confused with Femme Fatale Lacquer (though both are great). You can order these and other colors from the Femme Fatale store. These products were sent to me by Femme Fatale Cosmetics. The reviews are based entirely on my experience with the products and were in no way influenced by anyone.